Merua begins abruptly, with a grinding noise like that of a rusty propeller. The sound disappears rapidly, exposing a sonic bed of insect activity. 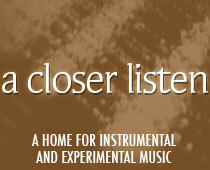 The listener has been warned ~ this field recording will not be entirely placid. Recorded in Honduras, the soundscape is drenched in the sounds of both jungle and sea. The Amazonian refuge of Merua is rich in sonic possibilities, and Frédéric Nogray is expert at drawing them out. Already by the fifth minute, we hear what may be monkeys on a waterfall; the mind creates its own pictures. Nogray is attempting to recreate his own sonic experiences, despite the fact that his first tapes turned out blank; in this recording, two expeditions become one. In his introduction to the piece, Nogray writes about the practice of shamanism as it relates to the understanding of the area. This ages-deep practice may be considered superstition outside the region, but within the Amazon, it retains a suggestive power; even Nogray is affected. Despite what modern minds may think of this spiritual custom, its theme of connection to land and ancestors is universal. The pursuit of peace – and as Nogray puts it, grace – also resonate with the modern mind, although the interpretation of “trance” may vary from person to person. In the classic, sense, Merua is a trance-inducing recording. Listeners may feel a sense of intense relaxation, combined with an increased awareness of sound that can be applied anywhere, even in an urban setting. To test one’s reaction, one may ask, “Is the mind free from distraction?” At various points in the recording, the opportunity for distraction exists: in the distant hum of machinery, the buzzing of a fly, the sudden shock of the opening second. The challenge is to integrate such sounds into one’s personal sound map. The single fly is no less a part of the natural soundscape than the local lake; the transport vehicles jockey for space and in so doing become part of the scenery. This being said, the elements unique to the setting (especially the animals of the 21st minute and beyond) provide Merua with its finest moments. The cries that seem natural to Hondurans (is that a snoring ape?) come across as otherworldly to those listening at home.